When InDesign suddenly starts behaving erratically, it may be due to corrupt preference or cache files. Closing InDesign, deleting (or renaming) these files and reopening InDesign will force InDesign to recreate a fresh copies. (Windows) Start InDesign, and then immediately press Shift+Ctrl+Alt. 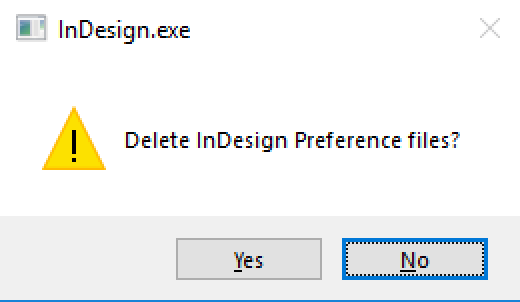 Click Yes when asked if you want to delete preference files. If you don’t see this message, either try again (it’s a timing thing) or move on to manually removing the files. (Mac OS) Start InDesign, and then immediately press Shift+Option+Command+Control. Click Yes when asked if you want to delete preference files. If you don’t see this message, either try again (it’s a timing thing) or move on to manually removing the files. Delete (or rename) the InDesign SavedData and InDesign Defaults files. Renaming allows you to restore the old files if this doesn’t fix the problem. If the problem persists, on to rebuilding the cache folders. To avoid frustration, please read the notes before you start. Note 1: These folders may be hidden in Windows. Use Control Panel > Folder Options (or File Explorer Options) and then click the View tab. Enable Advanced > Show hidden files and folders (or Show hidden files, folders or drive options). Note 2: Renaming the InDesign folders will remove saved Find/change queries, saved workspaces, etc. Once you establish that the software is working as expected, you can move those folders from the renamed InDesign folder into the new one. Note 2: Renaming the InDesign folder will remove saved Find/change queries, saved workspaces, etc. Once you establish that the software is working as expected, you can move those folders from the renamed InDesign folder into the new one.